Paul Richins Jr.'s 50 Classic Backcountry Ski and Snowboard Summits in California delivers detailed ski & snowboard route descriptions on fifty of California's best backcountry skiing peaks. 50 California Ski Summits includes ski descents of several California fourteeners, including Whitney, Williamson, White Mountain, Mount Sill, and Mount Shasta. You'll also find classic descents of Matterhorn Peak, Red Slate Couloir, Mount Dana, and Bloody Mountain. Richins organizes his tours by region, from north to south, assembling an impressively-comprehensive collection of California's backcountry skiing standards—from easy day tours to multi-day epics. 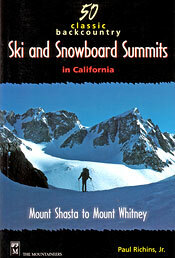 Compared to many of today's guidebooks, 50 California Ski Summits is refreshingly unambiguous. You'll find easy-to-read maps of each tour, plus road and trailhead information, and seasonal recommendations. If there is a quirk or tricky section to a particular route, Richins will call attention to it, or point out alternatives. This can be a godsend—particularly for the more rugged and remote regions of the south Sierra. Such clarity of detail (especially regarding maps and route descriptions) does take some of the rawness out of the backcountry skiing experience. If you prefer to work things out on your own, you may wish to just browse the book's maps, and avoid reading the route details until after your hike. On the other hand, if you prefer not to get lost or sandbagged, you'll love the author's clear, no-nonsense style. In addition to 50 California Ski Summits' coverage of the Sierra, the book offers an excellent section on skiing Mount Shasta, with four separate routes down California's Cascade giant—including, of course, The Hotlum-Wintun Ridge. Quite simply, this is the book that put me on the hill. I've collected many other guidebooks, but 50 Classic Backcountry Ski and Snowboard Summits gave me the information and motivation I needed to get out and ski the Sierra and beyond—and have a great time doing it.